Minford junior Nathan McCormick relays a ground ball to first base in the Falcons win over Wheelersburg Wednesday. Wheelersburg will face Minford in Pirate Country Friday with a chance at revenge against the defending SOC II champs. 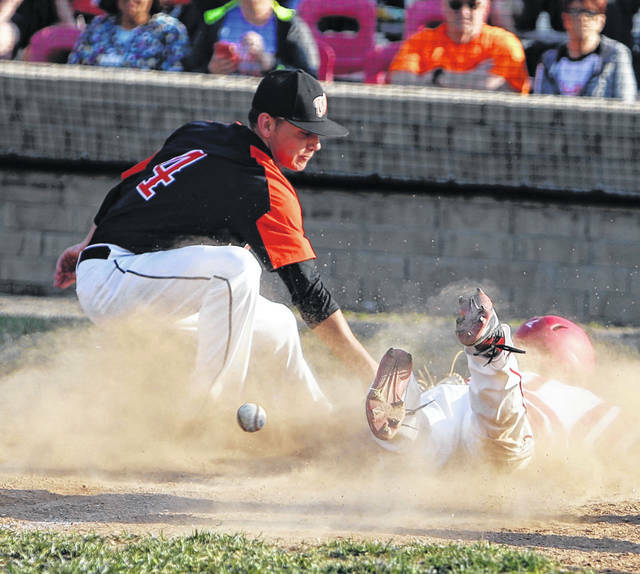 Minford senior Darius Jordan slides into home plate just before the tag of Wheelersburg senior Trey Carter. MINFORD — In a big game, on a big stage, Minford’s big players came up … well, big. 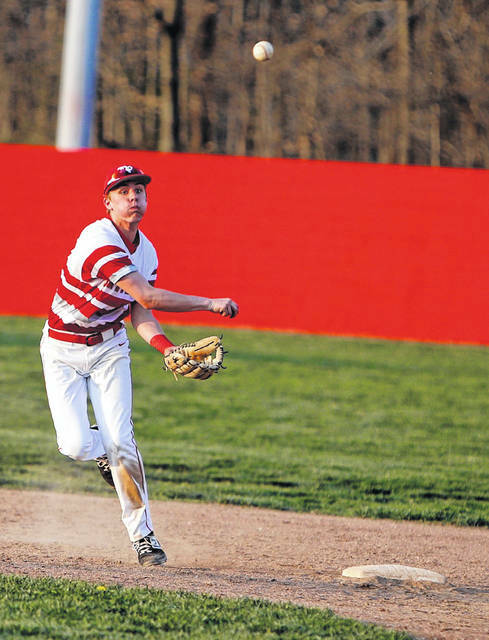 Behind Ethan Lauder on the mound, Reid Schultz at the plate and Darius Jordan in the outfield, the undefeated Falcons stayed perfect with a 5-3 win over Wheelersburg, Wednesday. Minford (11-0, 7-0 SOC II) has passed test after test this season. But none have been more important than Wednesday night’s. On the hill, Lauder was steady for the better part of 6 ⅔ innings. The senior allowed the Pirates (7-3, 6-1 SOC II) to put the ball in play but trusted his defense to get the job done. 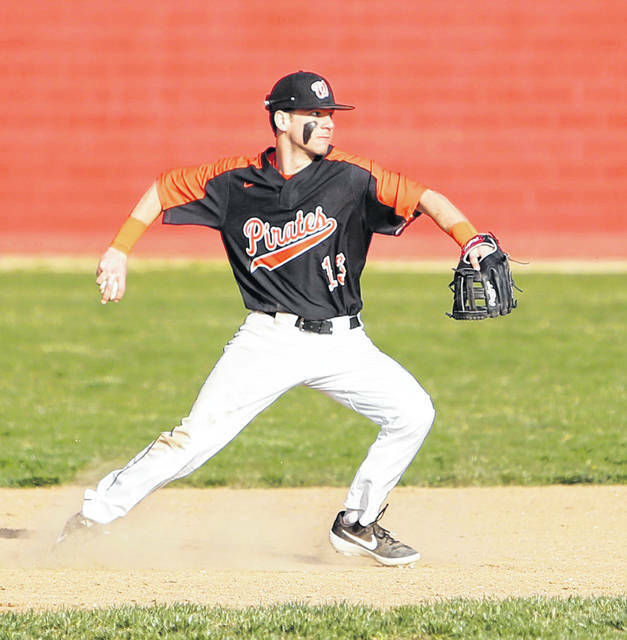 While Wheelersburg had nine hits, the Pirates continually left runners stranded on the base paths — including two that were standing in scoring position in the top of the seventh inning. Meanwhile, Minford took advantage of its earned opportunities against Wheelersburg starter Trey Carter. The lefty allowed just four hits but was forced to repeatedly work out of jams. In the third, Minford’s pressure got to Carter. Trailing 1-0, the Falcons drew three straight walks to begin the inning. With the bases loaded, Elijah Vogelsong hit into a fielder’s choice, forcing a 1-1 tie. Later, with two outs, Reid Shultz logged an RBI double, scoring Brayden Davis and, on the three pitches later, Jordan scampered home on a passed ball. All of the sudden, the Falcons had a 3-1 lead. Wheelersburg eventually tied the game, 3-3, scoring two runs in the top of the fifth thanks to an RBI single from Connor Mullins and a throwing error, allowing Mullins to score. However, in the bottom half of the inning, Jordan drew a one-out walk before Vogelsong striped a ball down the right field line. He raced all the way home with an inside-the-park home run and gave the Falcons a two-run lead they’d never relinquish. In the top of the seventh, Mullins started a two-out rally by drawing a walk. Jalen Miller then doubled to put runners at second and third with the go-ahead run coming to the plate. However, Shultz — in relief of Lauder — got Cole Ratcliff to pop out, sealing the win for Minford. Anthony Knittel, at 11-0, still hasn’t lost a game yet as Minford’s head coach. But he wouldn’t give himself any credit if you paid him to do so. Instead, it’s rationed out to those around him. Vogelsong led the Falcons at the plate, going 1-for-3 with a homer and three RBIs while Shultz was 2-for-3 with a double and an RBI. Mullins paced Wheelersburg, going 1-for-3 with a run and an RBI while Miller was 2-for-4 with a double. Will Darling also collected two hits and scored. The two SOC II titans get right back after each other, Friday evening at Wheelersburg, for the final installment of this year’s two-game series.